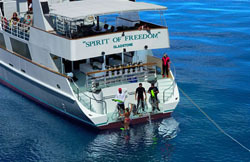 The Spirit of Freedom is a 120 foot liveaboard (Australia's largest) that will take you to discover what diving dreams are made of while traveling throughout the Great Barrier Reef and the Coral Sea. 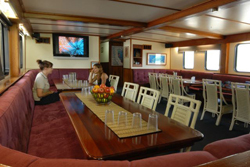 The vessel is fully air-conditioned and features three decks of spacious comfort including a sun deck, lounge and bar (fully stocked), dining saloon, huge dive deck, (2) Naiad Tender boats, (2) Bauer 21 CFM compressors, DNAx Nitrox system, as well as eleven private cabins equipped with individual temperature control and bathroom facilities. tables, TV and DVD Player. Ocean View - cabin 12 - One double bed, waredrobe, TV and DVD player. 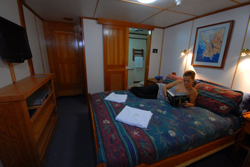 Double or Twin - cabins 3, 7, 8, and 9 - Double bed and single over, wardrobe, bedside table. Double - cabin 4 - Double bed only, wardrobe, bedside table. Twin Share - cabin 2 - Bunk style single beds, wardrobe. Quad Share - cabins 5 and 6 - Bunk style single beds, wardrobe. The boat is equipped with silent generators, and electronic stabilizers that provide a smooth and comfortable ride. 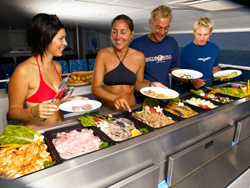 While staying on the Spirit of Freedom, your appetite will be satisfied throughout the day, while enjoying the delicious chef prepared meals, coupled with complimentary Australian wines at dinner. If you have specific dietary requirements, make sure to let the chef know. After dinner sit back and relax in the comfortable lounge and watch a movie from a large selection of DVDs. Got great bottom time, well you will love the Spirit of Freedom, as you may dive with your buddy at your own pace, with no limits on time, depth or style of diving outside of normal safe diving practices. There is an orientation dive offered as the first dive, and on remaining dives there is usually a safety instructor in the water; guided dives will be offer on at least one dive a day. While diving in the Great Barrier Reef or the Coral Sea, you will enjoy colorful walls and magical coral gardens in crystal blue waters. You will be surrounded by a plenitude of fish including whaler sharks, barracuda, rays, moray eels, and cuttlefish. The 'Ribbons' are a string of 10 coral reefs stretching over 100 miles to the north of Cairns, where you will enjoy beautiful coral gardens teaming with brightly colored fish. The Cod Hole lies at the top of the Ribbon Reefs, and is home to a family of resident Potato Cod (Groper). Don't forget your camera, cause these friendly giants love the photo op. Australia's Coral Sea reefs are located east/southeast/northeast of Cairns and about 62 miles offshore from the Great Barrier Reef, and can include the following dive locations: South Flinders, Flinders, Dart, East Holmes, West Holmes, Flora, Bouganville, Shark, and Osprey Reefs. 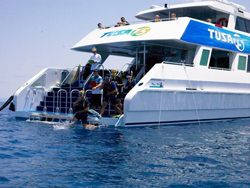 Tusa Dive, out of Cairns, has two of the most modern dive vessels available, and are equipped to carry up to 44 passengers. Each vessel was designed as a dive boat with state of the art navigation and communication equipment, on board compressors, spacious back deck areas and transoms that open onto water level platforms for easy entries and exits. The M.V. Tusa III and the M.V. 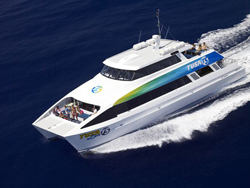 Tusa IV are 60 feet in length and can maintain a cruise speed of 20 knots, which will reach the outer Great Barrier Reef within 90 minutes from Cairns. Tusa Dive has 21 moorings to choose from, and during your day trip, you will have the opportunity to dive two of the best! You will explore beautiful coral gardens, wall drop-offs, with an array of colorful marine life. The Dive boats depart at 8:00 a.m. and return between 3:30 and 4:00 p.m.
Nitrox diving is available for certified Nitrox divers on the Tusa Dive day trips. Prebooking is essential, and an extra charge will be assessed. The M.V. 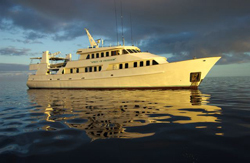 Tusa IV is available for private charter to diving destinations along Australia's far northeastern coast (Great Barrier Reef and the Coral Sea). 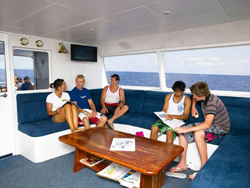 Combine Dive Tusa's local liveaboard experience (more than 6 years), superior crew, and state of the art dive vessel to customize a dive charter to suit the special requirements of your dive group. Number of days, departure times, and destinations are all at your discretion. The M.V. Tusa IV accommodates up to 14 passengers in double, twin, and quad share air-conditioned cabins.